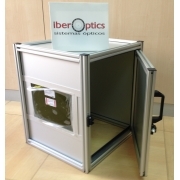 Iberoptics tailors laser protection and safety cabins (rooms) and enclosures. Depending on the laser, options such as laser protection windows or doors, ventilation holes and others, geometry and size, etc ... are available. Thus, we can quote a complete laser protection eclosure. We can offer you a cabin based on the Prometheus isoProtect material, which is delivered pre-assembled for doing by yourself the installation, thus saving a lot of money. Prometheus plates are certified EN12254 and are 4mm plates, on profiles. 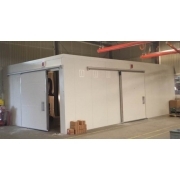 We can also offer cabins with complete installation and EN60825 certification. These are based on panels of about 8 cm to build Laserkubik cabins, a real laser castle. We also make enclosures of small dimensions, such as laser processing cells in laser production lines. We can also deliver Prometheus windows and panels with the size you exactly need for your laser protection and safety enclosure. We are the distributors in Portugal and Spain of the German leader in laser protection and safety: Protect Laserschutz. If you work with lasers remember our laser power and energy measurement section.